Theoretical and Applied Fracture Mechanics' aims & scopes have been re-designed to cover both the theoretical, applied, and numerical aspects associated with those cracking related phenomena taking place, at a micro-, meso-, and macroscopic level, in materials/components/structures of any kind. The journal aims to cover the cracking/mechanical behaviour of materials/components/structures in those situations involving both time-independent and time-dependent system of external forces/moments (such as, for instance, quasi-static, impulsive, impact, blasting, creep, contact, and fatigue loading). Since, under the above circumstances, the mechanical behaviour of cracked materials/components/structures is also affected by the environmental conditions, the journal would consider also those theoretical/experimental research works investigating the effect of external variables such as, for instance, the effect of corrosive environments as well as of high/low-temperature. The journal will also consider technical articles assessing the cracking behaviour of new materials used in modern and alternative applications, i.e., not only strictly related to engineering. Further, the most advanced technological findings in the surface engineering field are seen to strongly influence the cracking/mechanical behaviour of materials. Accordingly, technical articles investigating, both from a theoretical and an experimental point of view, the existing interactions between the above aspects and the material cracking behaviour will be considered for publication. The modelling of the phenomena of interest for the Journal can be based on the conventional linear-elastic/elasto-plastic Fracture Mechanics concepts as well as on novel (or emerging) theories. The journal is keen to publish new/alternative modelling/design approaches, provided that such innovative theories are soundly based on the state-of-the-art knowledge and, when possible, validated through appropriate experimental results. In more general terms, cracks act as stress/strain concentrators. Accordingly, the Journal is very keen to consider for publication also those studies investigating the effect on the mechanical behaviour of materials/components/structures of different kinds of stress/strain concentrators such as defects, microstructural in-homogeneities, and, above all, notches of any kind. In more detail, one of the new features of Theoretical and Applied Fracture Mechanics is releasing regular issues addressing, in a systematic way, the notch mechanics problem. In this setting, as for those studies involving cracks, such special issues will consider not only conventional, but also innovative materials subjected to both time-independent and time-dependent loading. The increasing computational power of modern computers is strongly encouraging the scientific community to develop novel methodologies suitable for modelling the mechanical behaviour of materials/components/structures containing any kind of stress/strain concentrators (i.e., not only cracks and notches, but also defects and microstructural in-homogeneities). 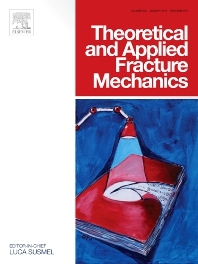 Accordingly, Theoretical and Applied Fracture Mechanics aims to publish, through regular issues fully focussed on computational mechanics, also those technical articles addressing the theoretical/computational aspects leading to an efficient and accurate modelling of the behaviour, at a micro-, meso-, and macroscopic level, of materials and structures containing stress/strain raisers of any kind. Themed threads, guest-edited by experts, where the themes of interest could not necessarily be addressed in a single issue: this would create a string of issues showing, over years, the progresses made in a specific area of the Fracture/Notch/Computational Mechanics discipline. The themed threads will be guest-edited not only by the Members of the Editorial Board, but also, as mentioned above, by leading experts. In this setting, the Editorial Boards is interested in considering possible topics directly suggested by leading experts also willing to act as guest-editors. Finally, the Journal will consider the publication of special issues containing the extended version of high-level papers presented at prominent international conferences. However, authors submitting papers of an experimental nature should include raw data with their submissions in order to support the findings being presented. The purpose of this requirement is to (1) Guard against falsifying test data and (2) Mitigate the misrepresentation of test data.